Geoff Corey has lived mostly in the wintry lands of upstate New York, where he never did improv, except for when carrying on daily conversation. Then he moved to Washington, D.C. and discovered WIT. Geoff is a communications professional obsessed with politics, trivia, and Lady Gaga. 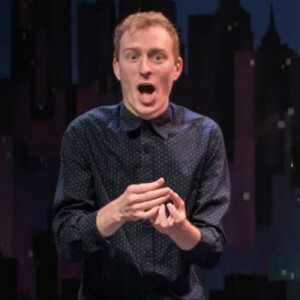 He wants to make the world a better place by investing your hard-earned tax dollars into finding a cure for hiccups, and replicating New York pizza in D.C.
Geoff took the full WIT curriculum before performing in WIT’s Harold Program for three years on Not Great With Kids and Wonder Whale. He joined the Ensemble team Nox! in July 2018. That I will grow up to be that man who hands out raisins on Halloween. The box step. Still working on what to do with my hands. Geoff Corey is a political communications professional, currently serving as Digital Media Director for a senior member of the United States Senate. Having previously served as Director of Communications and Manager of Legislative Affairs at a trade association focused on infrastructure policy, Geoff is an expert at translating complex policy ideas into phrases, brochures, and graphics the average American can understand. He has also founded student groups, and led fundraising initiatives for the University at Albany and the LGBTQ Victory Institute. Blue and yellow next to each other. Blue on the left.